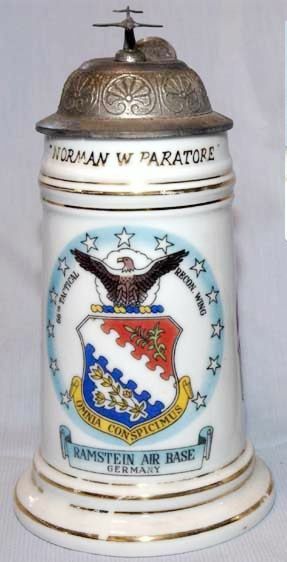 Norman is a member of the “Gambrinus Stein (Collecting) Club ” of Virginia, Maryland and DC, and of SCI. From all indications, there is a huge and growing interest in military steins bought by US Servicemen and women, mostly who served in Germany, and starting from the period of the late 50s through the end of the cold war. I followed a mid-1950s stein on eBay which I really liked because of the decorations, and it ended up selling for over $500!!! It (shown above) was a fabulously decorated stein from a unit that flew the old C-119 “Flying Boxcar” in the 1950s and is featured in the book “American Military Beer Steins Post WW II”, written by Alan Harrell. The hand painted decorations on this stein went around the entire body and some were quite humorous. This plane was also (and rightfully so) called the “Flying Coffin”. The propellers had this funny idiosyncrasy of suddenly, and without warning, going into reverse pitch. This of course would occur while flying, thus causing the plane to drop like a rock. The decoration on the stein is shown in the illustration below and it even shows a plane flying on its back and appearing to tumble or fall out of the sky. 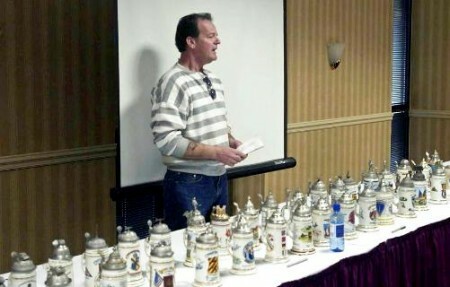 At one of the “Beer Stein College” meetings I attended, along with other antique stein collectors, Alan Harrell who is one of the serious collectors of these steins (and the one who brought the above mentioned stein) put on a great presentation. 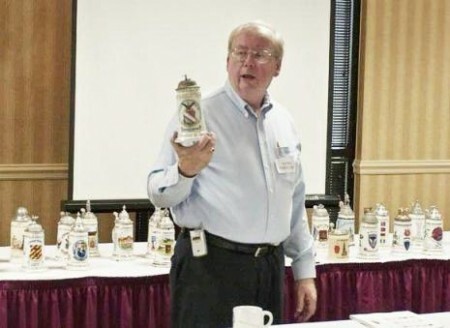 He and Ron Fox, another collector of modern military steins, brought about 75 of the “Cold War” steins (called Cold War Steins for lack of a better name) and you could easily see why they would be popular. First is the color – usually quite brilliant. Second is the history of the units involved, some of them going back literally hundreds of years. Third is the quality of the decorations and finials. Fourth – they were ours – meaning from United States military personnel. As I mentioned previously, and just like the original regimentals, the theme or decorations, as well as the rarity of units are what determines the cost. Gee – sounds like the same reasons people collect the original German regimentals! Several of the steins on display were particularly rare. One came from a Major General who was also the Surgeon General, another from a Four Star General, still others from Counter Intelligence Units. Several of the intelligence units have a neat finial, matching a figure painted on the stein. The steins have the usual unit designation, insignia, and scenes but they also have a hand painted figure in a long black cloak, a big floppy black hat pulled low over the forehead, a long dagger held in their hand, and a finial of that same mystical, secretive figure (see the photo second below) Really a great looking stein! Another stein, one of the other Intelligence units, showed a GI parachuting into a small village and landing on a roof, his legs appear to be straddling the peak of the roof. (OUCH!) On the street is a “lady of the evening”, dressed appropriately, a Shore Patrol (SP) jeep which appeared to be driving down the street towards her, and a male figure is frantically running down the street. Don’t know if he is heading towards the lady of the evening or just the next bar. Lying in the street is a broken beer bottle. The signs on all of the houses are names of bars and even a “strip” joint. Very well done decoration and quite humorous. The finial of this stein was a figure I call “The Spook”, a mysterious figure in a long black coat, big floppy black hat pulled low over the forehead, and a long dagger in hand, was used both in painted body scenes and as a pewter finial on steins for intelligence units. At the Beer Stein College mentioned above, the author of this article brought and talked about his own military stein purchased while stationed at Ramstein Air Base in Germany in the mid-60s. It was the only “Cold War Stein” that either Ron or Alan had seen and actually knew the owner. Either many of these steins have been sold off years ago by their owners or, more likely, are still in the possession of the family. I purchased my “Squadron Stein” while I was in the 38th Tactical Reconnaissance Squadron (TRS) from 1963 to 1966. The 38th TRS was part of the 66th Tactical Reconnaissance Wing, headquartered in France. The 38th was originally based in France but moved to Ramstein, Germany in the summer of 1962. At the time I was there, they flew the RF-101 – the reconnaissance version of the F-101 Voodoo fighter interceptor. The F-101 was the first plane with the ability to sustain supersonic flight while in level flight, had a top speed over 1,000 MPH, and set several closed course and time-to-climb world records. It was one of the first planes dispatched to Viet Nam when the US participation heated up. The plane was designed in the 1950s and while still a good plane, it proved just a little too slow for the Russian backed missile and anti-aircraft systems used in the Viet Nam war, a total of 33 of them ultimately being shot down in this conflict. Eventually, the RF-101 was replaced by the RF-4, which had a top speed several hundred MPH faster and was less prone to being shot down by ground fire. One little side note – the RF-101 was the main reconnaissance plane used by the US to overfly Cuba during the Cuban Missile crisis in 1962. Their motto was “Alone, Unarmed, and Unafraid”. In my humble opinion, the RF-101 was one of the most beautiful planes flying – much sleeker looking than the F-101 due to an elongated nose required to house the forward and side looking cameras. Here is the kicker, unlike the F-101, the RF-101 was a single-seater! This meant the pilot not only flew the plane but had to “fly the mission” as well. And, you might ask, what was the mission of these crazy solo dare-devils? They had to fly throughout Europe at 480 knots (over 500 MPH) at approximately 500 feet altitude! Imagine flying that fast, at that altitude, constantly monitoring untold number of instruments, craning their necks scanning the mountainous European terrain around, above, and below them; all the while looking for checkpoints to start the cameras rolling and trying to memorize everything they saw so they could debrief with the photo analysts upon returning to the base. Moreover, all this unarmed! I really have to tip my hat to the fearless pilots of those RF-101 airplanes. The RF-4 was a two-seater, which allowed the pilot to simply fly the plane while the RIO in the back seat flew the mission. Guess the brass finally realized that it took two people to fly this kind of mission. 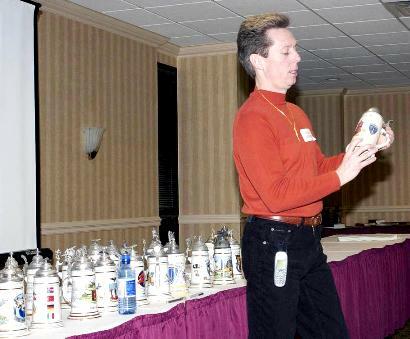 Mr. Paratore showing his own “”Cold War Stein at Beer Stein College No. 3. But, the era of the piloted recon plane ended when the SR-71 “Blackbird” was retired several years ago – all due to the budget cuts and downsizing of the military. The SR-71 is another story entirely but, for now, reconnaissance missions are exclusively carried out by satellite and most recently by RPV (Remotely Piloted Vehicles). If you were in the Gambrinus club during the first Iraqi war in 1991, you will remember my speaking of my son Doug, who fly the first generation of these RPVs from the Battleship Missouri during the entire Desert Shield/Storm campaign. Occasionally, you will still see a slow, lumbering U-2 fly over a country such as Iraq but only after all ground-to-air missiles have been neutralized. After all, Khrushchev and the Russians shot that dinosaur down in the early 60s. In addition to the two steins (yes – I bought two) I bought a matching coffee mug. As it turns out this was my first, true stein (lid attached) but it was to be another 25 years before I bought my second. Additional intersting photos showing the “Cold War Stein” display at Beer Stein College No. 3. “Cold War Stein” collector and book author, Mr. Alan Harrell talking about some his steins at the display. Over 75 were shown. “Cold War Stein” collector, Ron Fox, Past and now present (2012) editor of “Prosit” (SCI’s mag) and stein auctioneer, talking about his steins there atBSC #3 also. “Ifficient facts invite danger” Spock, STAR TREK Original series, 1966.